Sometimes you crave a delicious meat sauce but you just dont have time to let it simmer all flippin day to create that richness and amazing taste. Normally a good sauce requires time, TLC and extreme patience. 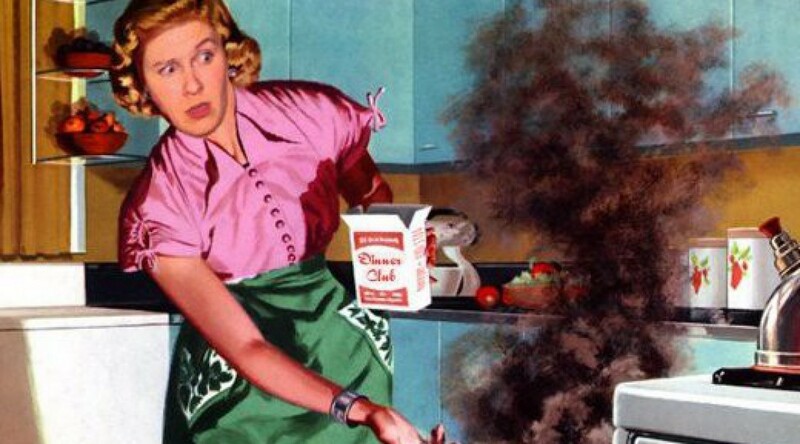 Well today is the day I share my efficiency with all of you and let you in on my 25 minute sauce that tastes like it’s been cooking all day long and that you have been slaving over a hot stove. Insert evil laugh!! The other great thing about this dish is that it is LOADED with veggies under the guise of a tomato based bolognese sauce. Its pretty much like a halloween costume because of it’s amazing ability to dress up as a pasta sauce but it’s really just your vegetable garden. Psyche!! 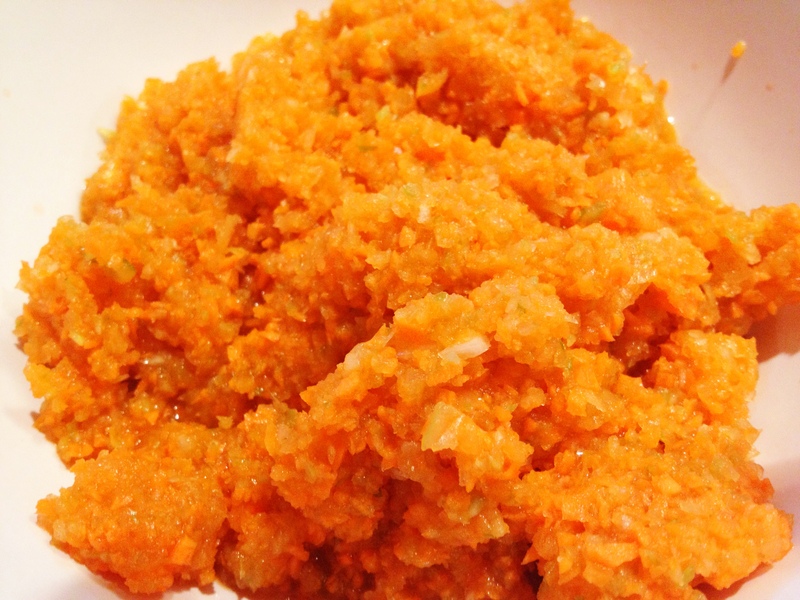 After you pulse the carrots, celery and onion in the food processor, it will look like a bright orange lump of pulp…that’s what you want! Next take 6 sausages (I use a sweet italian basil) and take them out of the casing. 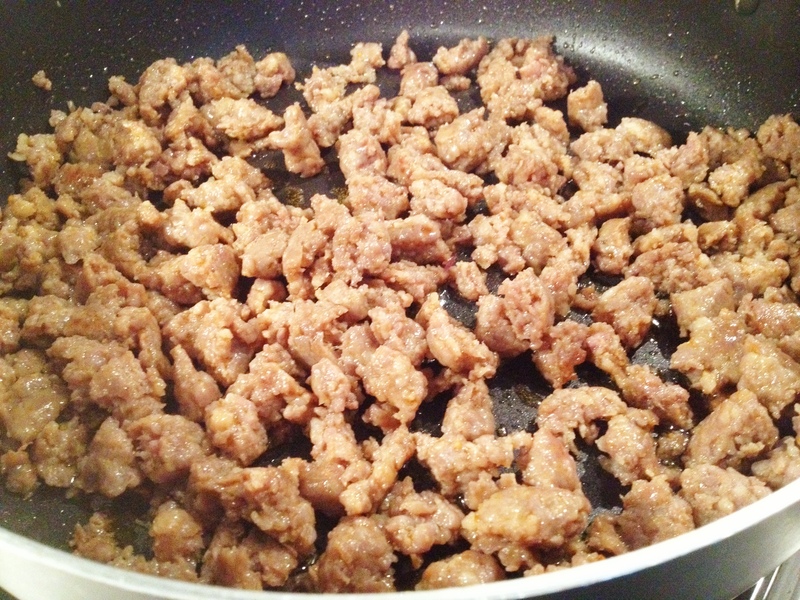 If you can find ground sausage meat without the casing, then go for it. Using sausage meat in pasta can be a great and quick way to boost the flavour because sausage is already loaded with herbs and spices which in turn saves you time. This picture is ridiculous…I get it. I contemplated not including it but it cracked me up so much I kinda had to. Yup, i’m pretty much a 15 year old boy…all the time! 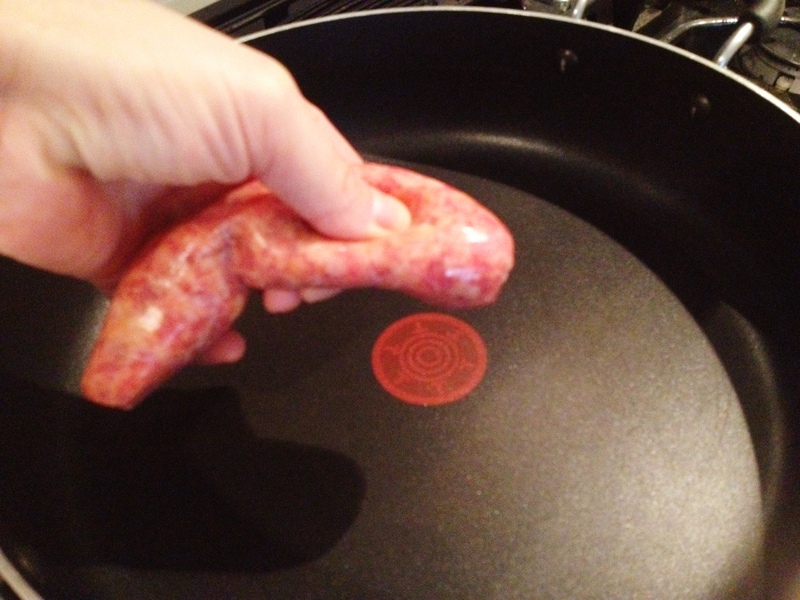 Fry up the sausage meat in a deep dish skillet. Make sure you crumble it along the way because you don’t want the pieces to be too big. Drain the excess fat. 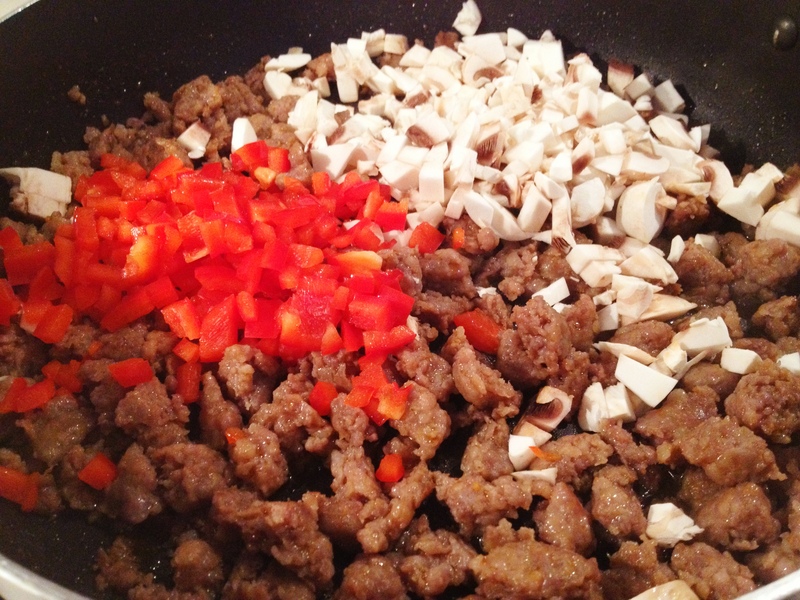 Add diced red pepper and mushroom and cook for about 1-2 minutes. Next add your orange pulp mixture from your veggies in the food processor. 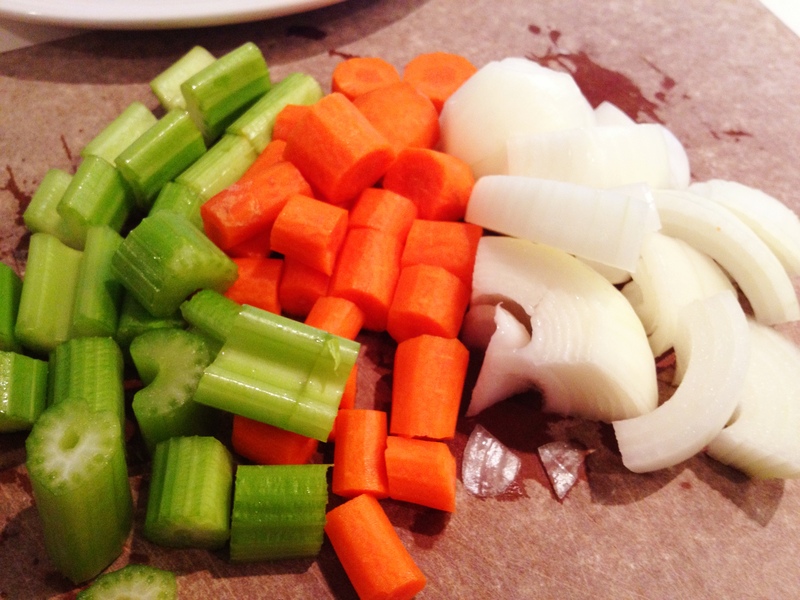 The puree’d veggies are going to add a thickness to the sauce that is incredible. The kind of thickness you only get after you’ve been cooking all day…not 25 minutes!! 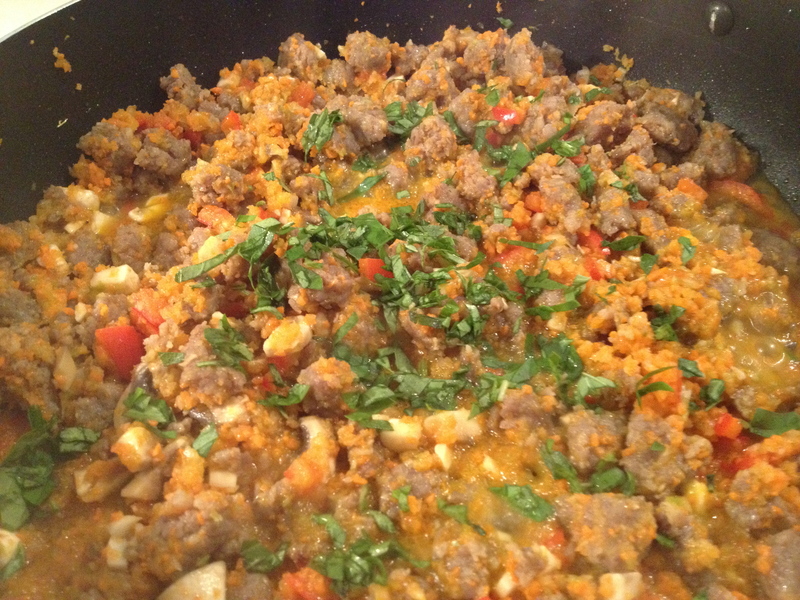 Add 1 Tbsp of fresh chopped basil and a tsp of dried oregano and stir. 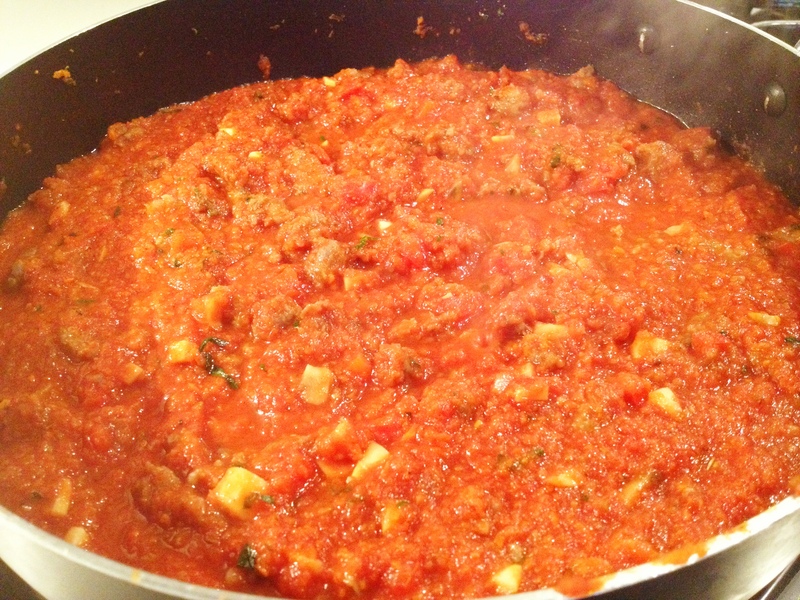 Add a big can of crushed tomatoes (no salt), the one I used was 796 ml (not 800…that’s right 796ml) and stir the mixture together. Add some ground pepper and a splash of balsamic vinegar, stir and then place the lid on and let the mixture simmer for 25 minutes on medium. Serve with noodles or zucchini spirals in place of noodles. This sauce is amazing!!! It has so much depth and flavour and only takes a short amount of time to cook. It’s a great weeknight meal that packs a punch. Add mushrooms and red pepper and cook for 1-2 minutes. 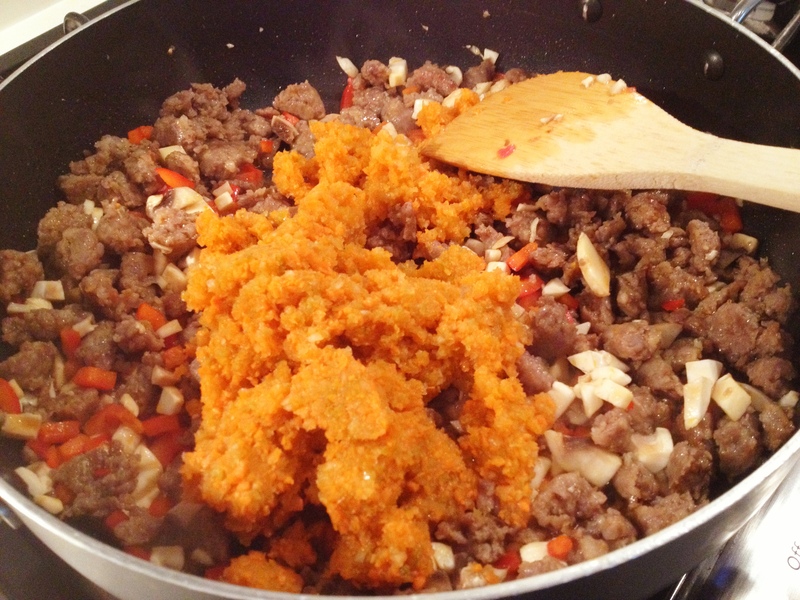 Add veggie pulp to the mixture and stir to mix everything together. Let the sauce cook for 20-25 minutes on medium. Serve with pasta or zucchini noodles. This sauce is so thick, rich and delicious and it will have your dinner table thinking you slaved all flippin day on this sauce. Just because you didn’t, doesn’t mean there is any less love on that plate. Hope you enjoy this moody little sauce that is a true illustration of efficiency!! Where do you buy your sausages Steph? I really like the sausages you can get at the meat counter at Thrifty’s…they are pretty good and affordable. The butcher in Edgemont Village is great but a lil pricey 🙂 Most of the time if i’m in a rush, good ole Johnsonville Sweet Basil sausages in a 6 pack does the trick everytime! !